So, getting global\screen coordinates from local coordinates in a isometric grid. where IsoX and IsoY are the global\screen coordinates of the grid's starting point (0, 0), while IsoW and IsoH determine the grid's scale and slant (2, 1 for standard 2:1 proportions). No canvas support means no fun. Another topic worth touching here is depth sorting (or drawing order). An obvious approach would be to sort objects based on their vertical position. With isometric grid, however, that would also mean developing a rather strange routine to draw the grid (going in "diagonal lines"), which may not be something that you want to do. Ground tiles (if any) are drawn first, then the object(s) are drawn on top of them. If multiple objects can occupy the same tile at different sub-positions, they are to be sorted based on vertical position. If there are any other things that I didn't cover here, do tell. Hello, first of all, thank you for publishing this. Second, dropbox links are dead, can you please fix them? This is very nice tutorial as always on your website, but I see some problem with demo project web and gmz. Very important in iso games is place/movement direction angles. It should be 0,45,90,135 etc. In your sample I see here direction is round, this is no problem, but objects (cars) moving not on straight angles and this is visible (shaking a little etc). Whole idea of good isometric projection is to have nice pixel lines. Here is good example http://flarerpg.org/tutorials/isometric_intro/ In short words, car should move in mentioned directions only too (0,45, 90 ….). 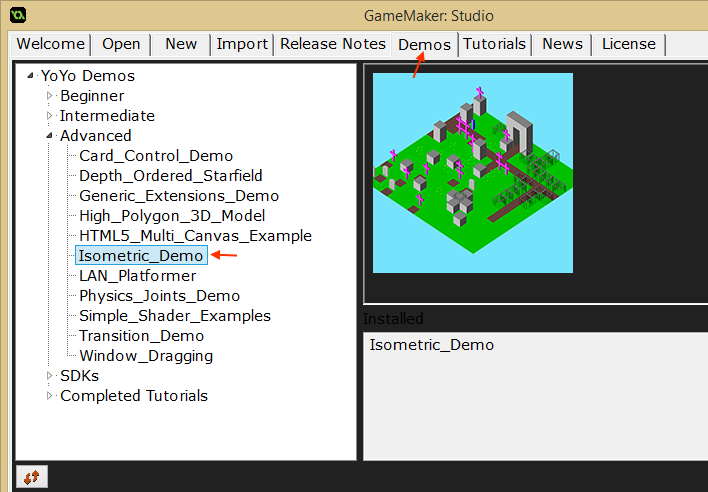 I’m asking, because I like your articles, and I’m looking for good and simple solution for game maker isometric grids. I have some pro component, but here also same issue. Can you look on this? Firstly, this is a great post as usual. My question would be how to convert screen angles to world angles? For example, an object in the center of the grid pointing to the center of the top-right edge of the grid would return 0, pointing to the top corner would be 45, the center of the top-left edge would be 90, etc. Is there a simple way to ‘skew’ the angles of the screen to make sense from the world’s point of view? You can convert iso coodinates to normal and calculate angle. If you know what that is a MVC, that Model have normal coordinate, but view – have iso coordinate, after changing model, you only need to show changes in right manner. If it’s an angle between points, quite often you can simply convert both points to isometric coordinates, and find an angle between those (now in isometric space). As WeslomPo has mentioned, it’s easier to get a grasp of if you consider that the actual game world remains top-down and conversions only happen when drawing things. I’ve been playing around with these isometric concepts, and I think I’m gaining a better understanding of them.